Relaxed and easygoing, designer Ray Larabie's Shifty Chica font from is perfect for invitations, posters, and other display uses. Regardless of the nefarious-sounding name, this TrueType font's deep descenders with extra curly serifs make me want to dig out my 1950's one-piece and stir up some Cherry Cola Salad. 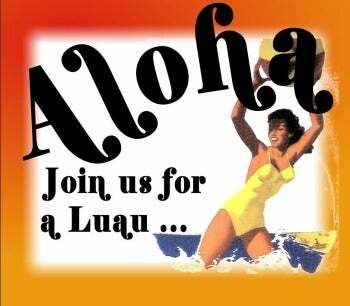 It sets the right mood for a Hawaiian-themed party invitation. You get both upper and lowercase letters with Shifty Chica, plus numbers and all the characters found on a regular keyboard. The apostrophe is straight, so can double as an `okina (one of two Hawaiian Language diacritical marks, the `okina looks like an upside-down apostrophe). Although the letters' bulk can sometimes make them bunch up a little, Larabie shows his skill as a typographer with generally excellent spacing, so good in fact that you could use this font as small as 12 point without making it impossible to read. That said, perfectionists may want to tweak the kerning of certain letter combinations. Shifty Chica is free for personal use; the designer suggests a donation of $40 for commercial use.